Published Feb. 26, 2018 at 6:06 p.m. The following is an op-ed submitted by Milwaukee Common Council President Ashanti Hamilton and Waukesha Common Council President Aaron Perry. When news broke late last fall that the City of Milwaukee had reached an agreement to sell water to Waukesha, one could almost hear a gasp of surprise heard across the region. How is it possible that the leaders in the two historically opposed communities were able to reach across the "divide" and agree on such a major deal? It's no secret that the journey to cooperation has seen ample drama and missed opportunities. The City of Waukesha had been working to obtain a long term sustainable water source for more than a decade. Lake Michigan water is the most sustainable source and the cheapest option. In June 2016, the Great Lakes Compact voted to approve the application. The intention for years was for Waukesha to purchase Lake Michigan water from the City of Oak Creek. Many in the City of Milwaukee had been opposed to the application, looking for a greater commitment from Waukesha on key issues such as affordable housing, public transit and transportation. But then we started talking about the future and our shared belief in a region that exudes its best qualities and strives toward its full, amazing potential. It started with a shift in thinking, and with listening to each other with an open mind. 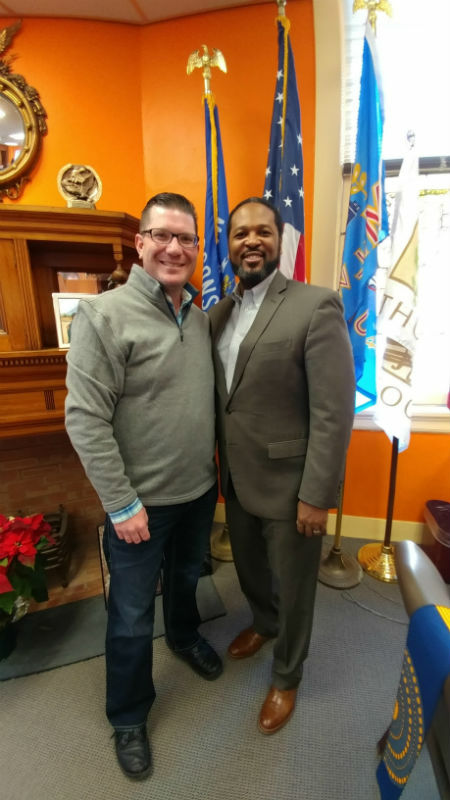 The conversation opened additional channels and in May 2017 communications began between City of Milwaukee leaders and City of Waukesha leadership. Leaders in both communities worked together and did what was mutually beneficial, and in December 2017, we signed an historic 40-year water sale agreement. The "win-win" agreement makes water cheaper than it would have been for Waukesha ratepayers and it assists Milwaukee in costs for needed upgrades for residents. Whether it's the new Bucks arena and related development Downtown, Foxconn or the new Northwestern Mutual HQ building and residential tower, we are seeing a wave of excitingly diverse and extensive investment in the region. We believe this is just the beginning, and we are asking, "What's next? Who's in?" For example, there's no reason why we cannot have a regional approach to transportation needs. With the huge level of investment we are seeing (Foxconn, Downtown, Bucks arena, etc.) in developments and infrastructure, we must strategically adapt our transportation system appropriately or face new problems. In that vein, we also hope to begin a serious discussion about a future rail system that can move workers and citizens efficiently throughout the region. Minneapolis, St. Louis and Atlanta are just a few of the large cities and regions with commuter rail systems in place and working well. We are excited about our economic and job growth, but we have to be able to get to point A and to point B in an efficient way. Why not here?